There are a lot of things to like about Jon Favreau's movie "Chef". Even if you don't love to cook (or eat), the idea that it is possible to (re)discover—and pursue—your passion (and at the same time make a living) is universally appealing. The movie is also a well-drawn reminder of the value of investing time in the relationships that in the long run are what give our work and our lives meaning. But even if the movie as a whole didn't make for an enjoyable couple of hours, as a cook, seeing the movie—and the out-take at the end—would be worth it just for the grilled cheese sandwich. Crisp and buttery on the outside...filled with soft, perfectly melted cheese on the inside...it looked (and sounded) amazing. It would be interesting to know how many people went home and made a grilled cheese sandwich after seeing the movie. I thought of this sandwich when I was putting together my slate of recipes for a new apple class. 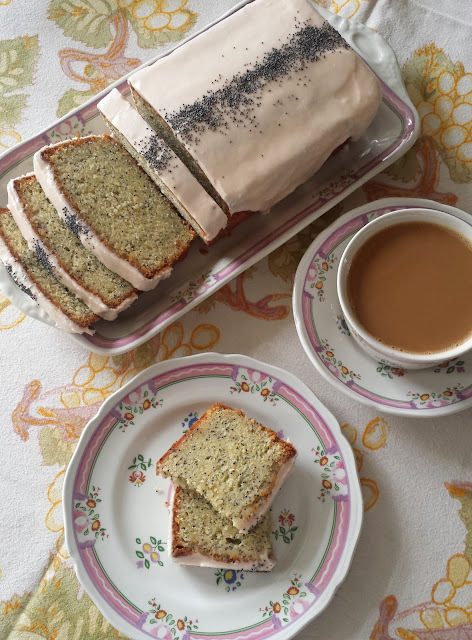 I have taught apple classes in the past—always focusing primarily on the different cooking techniques that can be used with apples. For this class, I was more interested in flavor partners for apples. And what goes better with apples than cheese? So, with the movie fresh in my mind, I added a grilled cheese sandwich with caramelized apples to the syllabus. I wasn't sure how people would feel about the inclusion of something as ostensibly mundane as a grilled cheese sandwich in a cooking class. I hoped they would like it. I was not prepared for it to be the hit of the class. I guess everyone likes a good grilled cheese sandwich. The kind of bread is not something I had thought too much about before I had to write and test a recipe for a grilled cheese. I keep substantial, artisanal-style loaves around (I don't remember the last time we had a loaf of commercial sandwich bread in our kitchen), and as it turns out these are the kinds of breads that make a good grilled cheese. They have a presence about them. Consequently, they toast to a tender—yet substantial—crunch. If your bread happens to be a bit stale, so much the better. I would even say that it is worth waiting for the bread to stale a bit before making a grilled cheese. "Older" bread—because it has less moisture—can absorb butter as it cooks without getting soggy, giving a solid surface from crust to crust of golden, crunchy toast as opposed to a grilled cheese that is crisp around the perimeter and a bit soft and squishy towards the center. As far as the choice of cheese is concerned, choose a good (real please), flavorful cheese that melts well (it should soften, not separate as it's heated). I like Cheddar, Gruyère, Dubliner, and Gouda-style cheeses. Cheeses like Fontina, low-moisture Mozzarella and Provolone are also good options, but not my favorite. These latter cheeses tend to become very stretchy as they melt...giving me the feeling that I might choke on a large impenetrable glob of gooey cheese as I try to eat my sandwich. I like cheeses that soften nicely—and have a bit of stretch...but not so much that I feel the need to set the sandwich down and use my hands to sever a rope of cheese stretched between the sandwich and my mouth. But I admit that this is a personal thing... You should choose the cheese you like best. While on the subject of cheese, I should mention that I think you can have too much of a good thing. Just as overly stretchy cheeses seem a bit choke-inducing, so I find that too much cheese causes the same problem. I have given what I think is a nice range in the recipe below—about 2 to 3 oz. of cheese for a standard to slightly large slice of bread. Two might seem a bit spare to some and three is on the outside edge of what I think is just right. Many recipes I have seen recommend four ounces of cheese per sandwich. This is way too much for me...but if it's what you like, go for it. Now, for the final detail: the cooking. I like to cook my grilled cheese sandwich in a cast iron or French steel pan. These are both non-stick and because of their weight they also hold a nice uniform temperature. Warm the pan up over medium to medium-high heat and butter the side of the sandwich facing you while the pan heats. Place this buttered side face down in the heated skillet. You should hear a distinct, but gentle sizzle. If you don't hear anything, increase the heat. If the sandwich sizzles loudly and aggressively, turn the heat down. Slide the sandwich around a bit to spread out the melting butter so the bread is uniformly and evenly coated. As the sandwich cooks, occasionally move and rotate the sandwich—and the pan—over the heat as necessary to obtain a uniformly golden and crispy slice of fried bread. If the pan seems dry, add butter in small increments—you don't want a greasy sandwich, but neither do you want one that is austere and dry. If there isn't enough butter, the bread tends to scorch...or just dry out. While the first side cooks, butter the side of the sandwich that is now facing you. When the first side is golden and crisp—after 2 or 3 minutes, carefully flip the sandwich over and continue to cook as for the first side...another 2 to 3 minutes. When finished, the bread on both sides should be uniformly golden brown and the cheese should be just melted. Pay attention to the heat. If it is too low, the cheese will be drippy and gooey—possibly even beginning to separate—before the bread is done. If the heat is too high, the cheese will not have a chance to melt. The goal is crisp, golden bread and soft—not liquid/curdled—cheese. You may have noticed my assumption that you will use butter in your grilled cheese. I suppose you could use olive oil...or possibly bacon fat...(both delicious fats), but butter is the taste I want in a grilled cheese. You will also get better color with butter since the milk solids in the butter brown and caramelize as the sandwich cooks. A plain grilled cheese...just bread, butter and cheese...is a very fine thing. But cheese is so tasty with so many things, that the desire to shake things up a bit occasionally by adding a flavorful tidbit or two is hard to resist. I think the key when adding things is to use a light hand. Just enough to give flavor and compliment the cheese.... The cheese should always be the star of the show. Also, if you are going to add something, make sure it is arranged in and amongst the grated cheese so the melted cheese can hold the sandwich together. It is disconcerting to have to hold the sandwich together as you eat because there is a solid sheet of something in the center that prevents the cheese from doing its work. Since the apple, shallot and prosciutto recipe from my recent class is really the reason for my post, I'm including that recipe. The salty, tangy, and sweet flavors of all of these ingredients are delicious with the cheese. A mix of Gruyère and sharp white Cheddar is my favorite choice for this sandwich. 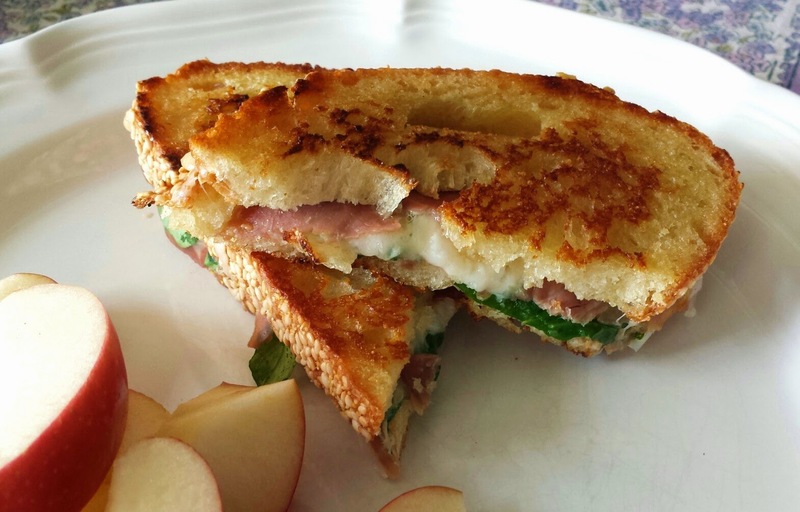 Earlier this year...in honor of National Grilled Cheese Sandwich Day (April 12)....I made one that was filled with Gouda, arugula and prosciutto. I didn't know it was grilled cheese sandwich day until right before lunch, so I had to make do with what I had on hand. But it was, as I'm sure you can imagine, delicious. 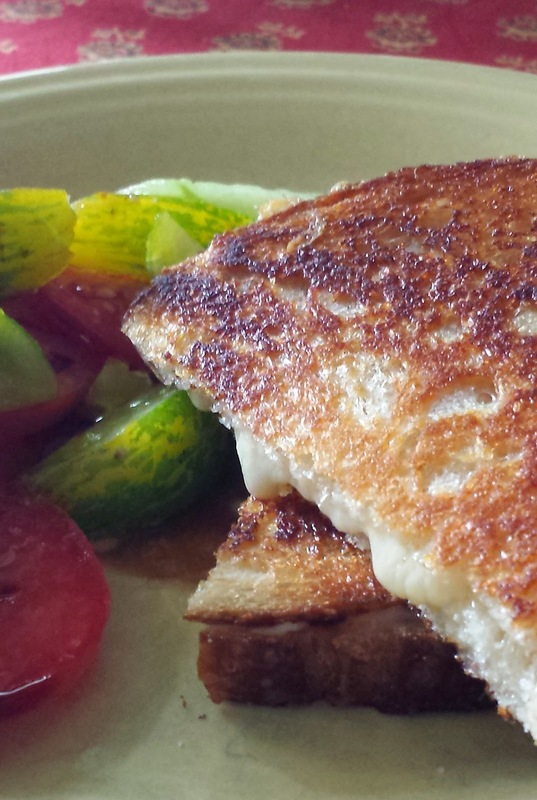 If you start poking around your refrigerator...or pantry...I'm certain that you'll find a few items with which to create your own delicious grilled cheese. Truly the possibilities are endless. In a large steel, cast iron or other style of non-stick skillet, melt a tablespoon of butter over medium-high heat. When the foam subsides, add the shallot and thyme with a pinch of salt and sauté until tender and golden—about 3 to 5 minutes. Remove to a plate. Add another tablespoon of butter to the pan. When melted, add the apples and sauté until limp—but still with a bit of texture—and caramelized in spots—about 2 to 3 minutes. Sprinkle the sugar evenly over the apples and continue to cook and toss/stir until the sugar has melted and the apples are uniformly golden—another minute. Scrape the apples onto the plate with the shallots and toss to combine. Let cool. To build the sandwiches, arrange the slices of bread in pairs on your work surface. Smear all of the slices with a scant amount of Dijon. Divide a third of the cheese among half of the slices. Arrange the prosciutto evenly over the cheese. Top with another third of the cheese. Evenly arrange the apple-shallot mixture on top of the second layer of cheese. Finish with a final layer of cheese. including a layer in the middle--is important. It helps the sandwich stick together! Top each with a slice of bread (Dijon-side down). Smear the tops of the sandwiches with half of the remaining butter (making sure to spread the butter all the way out to the edges). Heat a steel, cast iron or other non-stick skillet over medium to medium-high heat. When hot, add the sandwiches buttered side down to the pan. There should be a faint, but audible, sizzle when the sandwich hits the pan, if not, increase the heat slightly. Slide the sandwich back and forth to spread the butter out as it melts. Move and rotate the sandwiches and the pan over the heat as necessary to obtain a uniformly golden and crispy slice of fried bread. While the first side cooks, smear the remaining butter on the slice of bread that is facing you. When the first side is golden and crisp—after 2 or 3 minutes, carefully flip the sandwiches over and continue to cook as for the first side...another 2 to 3 minutes. If at any time the pan seems dry, add more butter in small increments. When finished, the bread on both sides should be uniformly browned and crisp and the cheese should be just melted. If the heat is too low, the cheese will be drippy and gooey before the bread is done and if the heat is too high, the cheese will not have a chance to melt. The goal is crisp, golden bread and soft—not liquid—cheese. Cut the sandwiches in halves or quarters. Recipe makes 2 large or 3 medium-sized sandwiches....serving 2 to 4 people, depending on appetites. Note: Choose any bread you prefer. Because Farm-to-Market is the bread that is most available for me, that is what I use. Their sliced loaf-style sourdough makes an excellent sandwich, as do their Rosemary Olive Oil and Semolina rounds. I have never used olive oil...I will have to give it a try! Your method sounds delicious...and very much in the style of an Italian Panini. As for sourdough...I love sourdough in a grilled cheese...and it does actually pair well with the apples as long as the "sour" flavor isn't too strong.